For more information, please see the the help file. This is a very different calculator than the traditional ones we are accustomed to. Enter any formula into the white box and press the Enter key or click the Calculate button. The result will appear in the gray box. 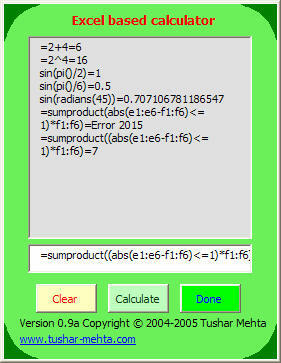 Calculate something as simple as 2+2 or as complicated as an array formula and the result appears immediately. Copy and paste an earlier formula back into the data entry box.